The Tillamook County Family YMCA charters all Tillamook County Little League divisions and teams. Through proper guidance and exemplary leadership, the Little League program assists youth in developing the qualities of citizenship, discipline, teamwork and physical well-being. 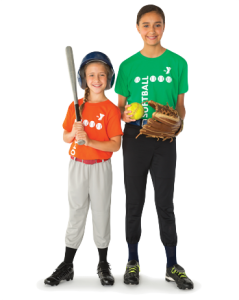 By espousing the virtues of character, courage and loyalty, the Little League Baseball® and Softball program is designed to develop superior citizens rather than stellar athletes. Serve, Set, Spike. The Y has volleyball during the fall. Youth will learn communication, decision making, trust, and teamwork while also learning how to be competitive with their peers. One of the fastest growing sports in North America. Soccer is fluid like daily life. Youth learn to think on their feet and will find themselves improving and focusing on skills of soccer while celebrating achievements and sportsmanship. Friday night clinics for 1st-3rd Grade Boys and Girls. Kids will learn fundamentals to help prepare them for future football programs. Basketball – In an effort to enhance the basketball experience, the Y has partnered with Rip City Academy, the Jr. NBA and Under Armour. These new partnerships, along with support from Tillamook High School, we are working hard to get youth a solid fundamental base to build from. Ages 16 & older. Must sign Player Code of Conduct at the front desk before participating. Must sign Player Code of Conduct at the front desk before participating.